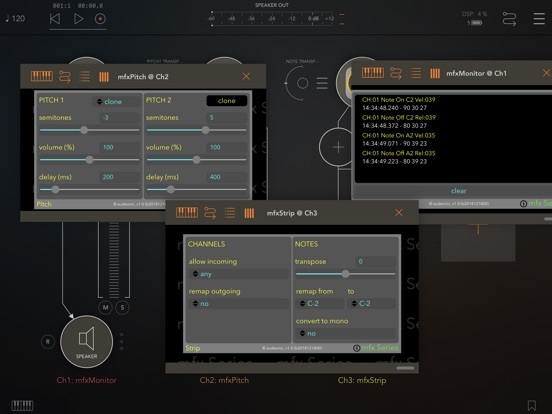 Audeonic released a suite of MIDI Effects for AUv3, and CoreMIDI, on iOS and macOS! 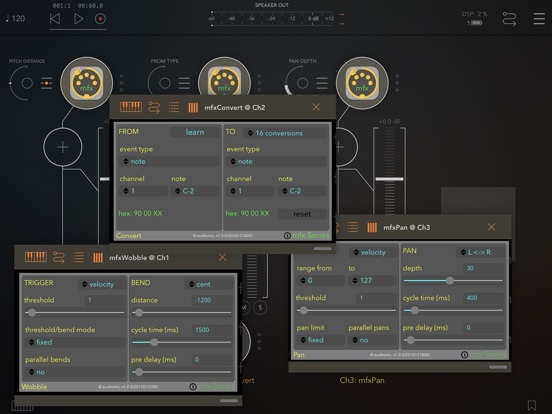 mfxMonitor is a free MIDI Monitor, mfxStrip is a MIDI channel strip, mfxPitch can be used for adding up to 2 additional pitched notes, mfxPan creates pan sweeps based on incoming MIDI events, mfxWobble for automated pitch bends, and mfxConvert for changing MIDI messages and channels. Update: Here is the link to pick up the whole bundle for $12. Contest: Audeonic is giving away 5 copies to readers here. You have your choice of which one you'll receive! Register and comment with which plugin (pick one) you'd like, and for which OS; e.g. mfxConvert iOS. Contest closed! Congratulations to RJB, Daveypoo, ajp, eVr, and bencruz! Emails will go out later today. Generate up to two separate additional pitched note lines each with it's own delay and level. Pitch range is +/- 2 octaves (24 semitones or 2400 cent). Really effective in giving leads and pads some extra oomph or adding fifths, thirds or the like. mfxConvert is a plugin for converting MIDI events in real time. It can be used for simple channel, note or controller remaps. However, it can also handle sophisticated conversions of event types, for example pitch bend to controller or note velocity to channel pressure. See [iTunes Description] for the supported conversions. Simple to operate yet a very effective tool to have at your disposal. Create as many separate conversions as you need inside the one utility. There's even a demo video for all of the apps on the official Audeonic YouTube channel. Thanks for the link to Audeonic’s MidiBus, Tim! Hadn’t made the connection. Been waiting for some of those apps to go AUv3 and bought StreamByter as soon as it came out. But I didn’t realize that so many apps were using library. ‘Figures! Interesting that these plugins would also be available as Audio Unit on macOS. Hadn’t noticed that it was the case for StreamByter. Someone coded a simple chord rotator (to create the “Michael Brecker Effect”) using StreamByter. Didn’t realize I could use the same script in Logic Pro X (and MainStage). Interestingly, Robby Kilgore (who created the original effect on the Oberheim Xpander) has released his own VST/AU MIDI Rotator plugin. At this point, though, mfxConvert for iOS is the one which interests me the most. It should help me use some devices with fixed CC, especially hardware ones. For instance, my main wind controller (Yamaha WX11) sends breath control through CC02. One of the most useful things to do with breath is to modulate the cutoff frequency of a lowpass filter. In many softsynths, it’s easy enough to reroute CC02 to filter cutoff via “MIDI Learn”. But my hardware synths don’t respond directly to CC02. I’ve used Audeonic Apps for this very reason (including FreEWI). But my setup is now mostly based on AUv3 hosts, which are much easier to use than “Core MIDI”. At any rate, thanks for letting us know about the background for this series of plugins, Tim. Part of the service you offer (and for which we’re really grateful) is some of the context behind the apps. It’s easy enough to hear about new apps. But we don’t necessarily notice where they come from. mfxConvert, thank you, thank you very much. Guys please include the OS you want so I know if you want iOS or macOS. Understood. But, as is so often the case, shifting a line in a text to make it more obvious can make a huge difference. Hadn’t paid attention to the writeup about the apps but the clickable link got me to pay attention to what the relevant information. In other words: I just wish app devs didn’t bury the lede! mxfPitch iOS - thanks Tim and audeonic! mfxPan for iOS, please and thanks! POsted earlier but realized I failed to add the OS. mfxConvert for iOS, please Tim. Thank you! Mfx Strip for IOS please. I like that we're seeing so many nice MIDI utilities for iOS. I would have thought Mac OS would have continued to lead the way with MIDI stuff.